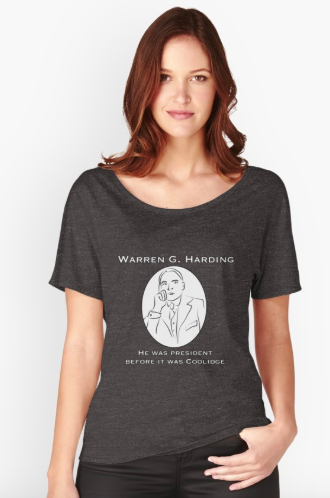 Did you know that yesterday was the anniversary of Warren G. Harding's untimely demise? And did you know that today is the anniversary of Calvin Coolidge taking the oath of office to fill Harding's place? Celebrate the occasion with my brand-new shirt (inspired by @potus_geeks). 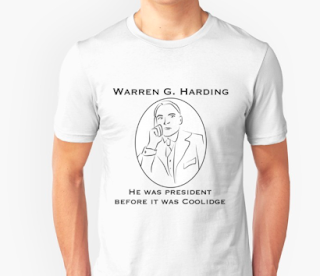 Warren G. Harding: He was president before it was Coolidge. While you're shopping, be sure to look for the Raise a Glass to Freedom shirts (available in regular or rainbow colors) and create a whole Presidentress-approved wardrobe. In 1913, Teddy Roosevelt traveled the Amazon basin and almost died! Thankfully you can "travel" to "Amazon" without leaving the comfort of your own home, and probably without dying. Presidentress is a participant in the Amazon Services LLC Associates Program, an affiliate advertising program designed to provide a means for sites to earn advertising fees by advertising and linking to Amazon. Win an Autographed Copy of "Hottest Heads of State"!